Timing Belt Kit Water Pump Fit 03-08 Honda Odyssey Acura MDX TL J32A J35A J37A. Part Numbers: TBK329(M)-GMB, WPH-801, 2 = 38.5 x 53 x 8, 1 = 41 x 56 x 8. Application-specific design for a perfect fit. Meets all OEM performance requirements. Manufactured with tough, wear-resistant fabric and high tensile strength cord for high resistance to oil and engine heat. Includes water pumps that are designed and built for long lasting, efficient cooling. Designed to deliver trouble-free, consistent performance. Since our very beginning, Aisin Seiki has been built on a long-standing dedication to quality first. Engine Timing Belt Kit, Engine Water Pump. 3.5L 3471CC V6 SOHC. (24 VALVE), ENG CODE "J35A5". 3.7L 3664CC V6 SOHC. (24 VALVE), ENG CODE "J37A1". (24 VALVE), ENG CODE "J35A8". 3.2L 3210CC V6 SOHC. (24 VALVE), ENG CODE "J32A3". 3.0L 2977CC V6 SOHC. (24 VALVE), ENG CODE "J30A4, J30A5". 3.0L 2997CC V6 ELECTRIC/GAS SOHC. 3.0L 2997CC V6 SOHC. (24 VALVE), ENG CODE "J35A6, J35A7". (24 VALVE), ENG CODE "J35A6, J35A9, J35Z1". (24 VALVE), ENG CODE "J35A9". (24 VALVE), ENG CODE "L66". 3.5L 3474CC V6 SOHC. 3.5L 3475CC V6 SOHC. We firmly believe our parts are free from any defects in workmanship, material and that all manufacturing is processed under a strict quality control environment. Absolutely no exchanges will be made for any products that has been damaged, misused or improperly installed. We highly recommend that a licensed professional bear the responsibility of proper installation. Our goal is to provide our customers with the best products at the best price without compromising quality. We have been in the car parts business for over 20 years. We specialize in engine parts and accessories. All of our parts are specially made to meet or exceed OEM standards and performance requirements. No matter whether you're doing basic repairs and maintenance, modifying your car's engine, our great selection of brand name products and knowledgeable associates will ensure success with all your engine rebuild projects. Our expert staffs are available 24/7 to help. 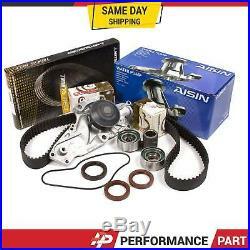 The item "Timing Belt Kit + AISIN Water Pump for Honda Odyssey Acura MDX RL J30A J32A J35A" is in sale since Wednesday, January 8, 2014.